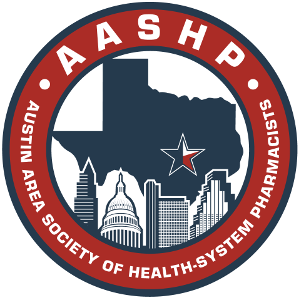 AASHP is an affiliate of the Texas Society of Health-System Pharmacists and the American Society of Health-System Pharmacists. Provide the benefits and protection of a qualified institutional pharmacist to the patient, to the institution which he/she serves, to the members of allied health professions with whom he/she is associated, and to the profession of pharmacy. Assist in providing an adequate supply of qualified institutional pharmacists. Assure a high quality of professional practice through the establishment and maintenance of standards for professional ethics, education, and through the promotion of economic welfare. Promote research in institutional pharmacy practices and in the pharmaceutical sciences in general. Disseminate pharmaceutical knowledge by providing for interchange of information among institutional pharmacists and members of allied specialties and professions. Develop professional communications between institutional pharmacists and nursing home or small hospital consulting pharmacists, as well as with the other allied health professions. Promote fellowship among members of the pharmacy profession.